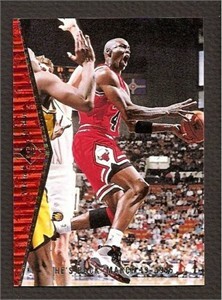 1994-95 SP He's Back insert card #MJ1 commemorating Michael Jordan's return to the Chicago Bulls on March 19, 1995. NrMt-Mt. ONLY ONE AVAILABLE FOR SALE.